Ages 4 through 10. 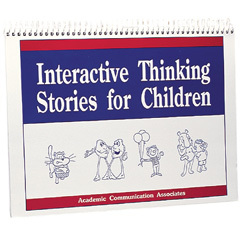 Use these high-interest short stories to develop language and social interaction skills. Answering questions, remembering auditory information, sequencing story details, solving problems, and interacting in a socially appropriate manner are among the skills emphasized. Stories relate to issues such as being responsible, reacting appropriately to teasing, social rejection, etc.